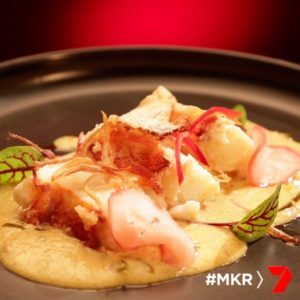 It is the first Semi Final for My Kitchen Rules 2016. Tasia and Gracia take on Giani and Zana, the winner will be through to the final. Tasia and Gracia are currently first on the leaderboard, Giani and Zana are last. It is the first time Tasia and Gracia have had to cook off to stay in the competition. They have 1 1/2 hours to serve their first of 3 courses to the judges. Giani and Zana are making beetroot and goats cheese ravioli with sage butter for entree, beef goulash with heirloom carrots and a pickle for main and Krempita with Vanilla Poached Figs for dessert. 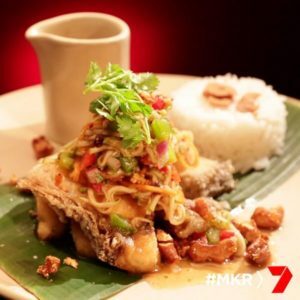 Tasia and Gracia are making lobster tail with yellow curry sauce and taro chips for entree, crispy fried barramundi with apple coriander and tamarind dressing for main and coconutCoconut Panna Cotta with Passion Fruit Curd and Lychee Sorbet for dessert. They both are quick off the mark. Giani and Zana start on the filo pastry for their dessert and the pasta for their entree. Tasia and Gracia start on their curry for entree and the panna cotta for the dessert. Gracia is making some taro chips to go with the curry. Gianni takes the beetroot out of the oven and thinks they could do with a bit more cooking but Zana tells him to hurry up and just do it. She constantly tells him to hurry. Tasia is taking the lobster out of the shell. Gracia checks the lobster and finds some poo in it so she tells her sister to make sure she cleans them properly. Gracia takes the taro chips out of the oven and they haven’t worked and are soggy. She decides to cook them in the deep fryer instead and they worked well. Gianni is rolling out the beetroot dough. Gainni is concerned that his pasta is not going to work out properly. It goes through the machine three times and he is happy with the consisitency. He fills the ravioli and they are looking good. Tasia and Gracia taste the curry, Tasia is happy with it but Gracia adds some more ingredients anyways. The lobser is cooked and they cut it up ready to serve. There is only 10 minutes on the clock and Manu tells the team to start plating up. Both teams plate up on time. It’s time for the dishes to go out to the judges. The judges are Pete, Many, Liz, Karen, Guy and Colin. They taste the lobster tail dish first. Guy says what a great start the a three course meal. Karen says the lobster is cooked perfectly. Colin says the standard has been set high and it’s a top notch dish. They now taste the ravioli dish belonging to Zana and Gianni. Liz says it tastes beautiful and she loves the sage butter. Guy likes the zing of the goats cheese. Colin has cleaned his plate, he loves it and says it is a competition winning dish. 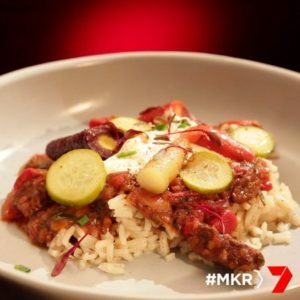 Pete says two perfect dishes for the finals. 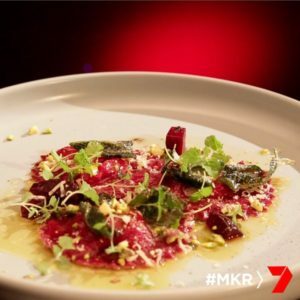 Both teams get back into the kitchen to prepare their mains. Zana and Gianni have their goulash on the stove which has been cooking since entree. Gianni is preparing some heirloom carrots to go with it. Gracia is making a sauce and is adding more chilli. Gianni is making a creme patisserie for their dessert. Zana is rolling out some pastry for dessert. Tasia is making some candied cashews to add some crunch to the dish. Zana is still preparing some filo pastry for her dessert. Tasia begins preparing their dessert. She making some passionfruit curd to go with the panna cotta. Zana decides that the goulash is too runny so they are going to seperate it into two pots to get it to reduce it faster. Zana tastes the goulash and she is not happy with the flavour. They add herbs and some more paprika. Tasia and Gracia cook their fish in the deep fryers. It’s time for the teams to plate up. Zana is concerned about how they’re going to make a rustic dish look pretty. Gianni is happy with the rustic preparation. The dishes go out to the judges. The judges taste Tasia and Gracia’s fish first. Karen says the fish is crispy and delicious and she likes that the skin has been left on. Guy really loves the sauce and so does Colin. Pete says the ingredients all work really well together. Now they try Zana and Gianni’s goulash. Liz says it’s really hearty home cooking. Colin likes the flavour. Guy says he can taste a little bit of a burnt flavour that might have been from the bottom of the pot. Karen and Manu can also taste the burnt flavour. The teams have 30 minutes to prepare their desserts. Zana gets the figs into the poaching liquid. Tasia is toasting some coconut for a garnish. Gracia is putting the lychee sorbet into small containers. Zana and Gianni taste their filo pastry for their dessert and they are really happy with it. Tasia and Gracia are trying to un-mould their panna cottas and they are nice a and wobbly. Both teams start plating up their dishes for dessert. Both teams finish on time and are relieved to have their dishes plated up. 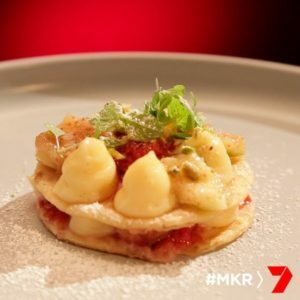 It time for the judges to taste the final dish for tonight. The judges taste Tasia and Gracia’s panna cotta first. Colin says the panna cotta is quite sweet but its a very good dessert. Guy says it is a very good panna cotta and the curd is great. Manu says the panna cotta is smooth and silky. They now try Zana and Gianni’s dish. No judges comments are shown. 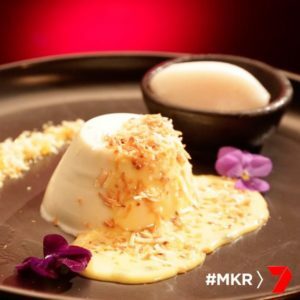 Gianni and Zana have been eliminated from MKR tonight. Tasia and Gracia are through to the grand final.